Timothy Pachirat, the author of Every Twelve Seconds, Among Wolves, “The Tyranny of Light,” and “The Political in Political Ethnography” will be coming to the University of Utah on February 13th and 14th to conduct workshops on doing ethnographic research, issues of ethics in ethnography, and his current research projects. He will also be doing limited meetings with students and faculty members (students will take first priority) to discuss research projects and ideas. For both days, a free lunch will be catered by Spice Kitchen and include both gluten-free and vegan options. In order to make sure that we have enough food and supplies for the workshops, please RSVP at devon.cantwell@utah.edu or RSVP on OrgSync. While participants are encouraged to attend all sessions, please come even if you are only able to stay for part of the time or days! The first talk, “Ethnography and Interpretation,” is a higher altitude talk that covers the ontology, epistemology, and philosophy of science around ethnography. It is a good introduction to ethnography, but not good at all for getting a sense of how to DO ethnography at a practical level. The second lecture, “Ethnographic Ethics and Practice,” is much closer to the ground and deals with the praxis of ethnography–how to actually DO it. 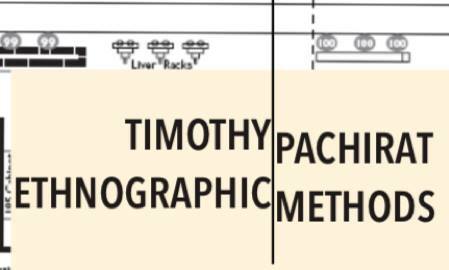 Finally, Timothy will be doing a two-part applied component to the workshop which will allow participants to actually do participant-observation research, develop fieldnotes, and analyze them.